Our ability to create music and interpret sounds depends on our body's capacity to mechanically interpret wave patterns, not through quantitative differences but proportional differences. All our bodily senses work because our nerve receptors are able to attune to variations in proportion of input frequencies. Even our sense of smell is reliant on our ability to interpret the geometric construction rather than the molecular substance of a perfume. Our visual sense differs from our sense of touch only because the nerves of the retina are not tuned to the same range of frequencies as the nerves embedded in our skin. Hidden within the architecture of material existence are the geometric forms, the building blocks which make life possible as we know it. The architecture of the buildings we inhabit as our dwellings, our work places, our healing and education centres, and our churches and temples, has similar impact on our senses as the architecture of nature. Apart from any psychological influences, it is mainly the geometric spaces and the materials of the structures that influence our responses. Our sense of proportion tells us when a space or object is harmonious, and our mood responds accordingly. In much the same way we identify sounds as being pleasing or otherwise according to their wave frequencies and the proportional relationships between combinations of different notes. It is our spatial awareness that connects us or repels us with items that we normally perceive to be remote and external to us. It is a biological relationship that occurs at the cellular level between the myriad components of our physicality. During many years of designing and building, I observed the responses of people to different geometric forms that I had incorporated into my structures. I observed that certain forms, as a consequence of their proportions or their geometry or both, seemed to evoke favourable responses. I also observed there was a 3-dimensional or non-square element to those spaces. On the other hand I observed little or no response to the conventional square spaces most commonly found in modern architecture. Because we cannot perceive other dimensional realities with our physical senses, but only through our psychic sensitivities, many people do not accept that they exist. When we are fully evolved at the completion of our sixth cycle, we will come to realise that we actually create our reality through our beliefs. We will eventually come to understand that we are the creators of the world as we see it, we create good and evil simply because we believe in them. It is our total absorption with the physical world and our rejection of the spiritual world that has brought this about. The creation process simply contains the potential for polarities, and we do the rest. I will not go into this in detail, but in the ensuing analysis of the sacred symbolism of certain numbers it is helpful to have a background understanding as to how creation works. It is not, however, essential knowledge for all potential pole frame house builders. Be mindful, therefore, that it is not only the application of numbers and patterns that can stimulate the senses, but the intent that this be so. When we harness the powers of thought with these things in mind, we change our reality and the way we experience within it. Thankfully, with some commitment and effort, we can do that on an individual basis, and so we need not be completely overwhelmed by the influence of the mass consciousness. Our true existence is a blend of matter and spirit. When spirit is suppressed, it appears to us that it does not exist, but that is not so. By excluding spirit from our reality, our senses are dulled, and the potential for resonance at refined frequencies of existence becomes impossibly elusive. The intention behind my architecture is not only to try and stimulate the senses, but to try to awaken the spirit within. I believe it is the simplicity behind the forms and the concepts that makes this a possibility. p (Pi) and f (Phi) are numbers that have been a source of fascination to mathematicians for thousands of years. Both are indeterminate or irrational numbers, ie they can never be expressed in a finite number of digits. They are numbers that go on forever without displaying any pattern or repetition. Any yet they both express specific geometric relationships – p the relationship between the diameter of a circle and its circumference and its area, and f the relationship between the side and the diagonal of a pentagon. f is particularly fascinating, partly because it appears in mathematical expressions in many quite extraordinary ways. It also appears in nature as the mathematical basis of the spiral pattern seen in the leaf and petal arrangements of many plants, in mollusc shells such as the chambered nautilus, and in the patterns of billions of stars contained within galaxies. Its extraordinary qualities have been a constant source of inspiration to scientists, philosophers, artists, musicians and architects for many centuries. Because of its almost mystical properties it has come to be known as the Golden Ratio or the Golden Mean. It led the British scientist, Sir James Jeans (1847-1946), to famously pose the question – "Is God a mathematician?" Euclid (300 B.C.) is considered to be the founder of geometry as a formal system for mathematical deduction. He defined a proportion derived from a simple division of a line in such a way that the ratio of the larger segment to the smaller segment is the same as the ratio of the whole line to the larger segment. Consider a line divided into two segments, the length of the larger segment being a, and the length of the smaller segment being b. Then the proportionality of the golden ratio is described in the equation f = a / b = (a + b) / a. To quantify this equation numerically we take the length of the shorter segment (b) as 1 unit. Then a / 1 = (a + 1) / a. This produces the quadratic equation a2 – a – 1 = 0. The positive solution to this equation is a = (1 + Ö 5) / 2 = 1.6180339887… f = a / 1 = 1.6180339887… the Golden Ratio. 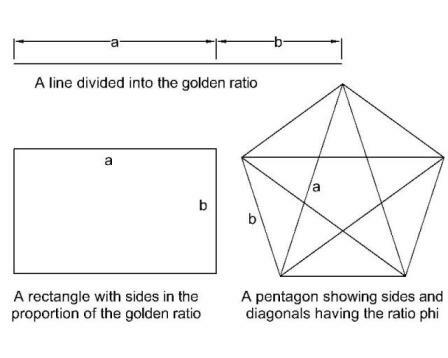 Another way of defining f is by the ratio of the side of a pentagon and its diagonal. The triangles contained within the pentagon have some interesting properties; the ancient Greeks were particularly interested in the association of f with the pentagon and the pentagram. The Golden Ratio was considered to represent perfect harmony, and was used by them in many of their temples and works of art. It appeared similarly in ancient Egypt, including the Great Pyramid, although there is no evidence that the Egyptians were aware of its mathematical implications. It appears frequently in nature, as does the pentagon and the number 5, for example in the arrangement of leaves and petals in many flowers. Buildings which incorporate the Golden Ratio certainly tend to be pleasing to the eye compared with buildings constructed with less harmonious proportions. However, whether they impart a specific vibration that benefits the occupants I would not be prepared to offer an opinion. I have more definite views on the use of the pentagon, and of course, contained within the pentagon is. The Fibonacci sequence is an arithmetic series beginning with any two numbers. Each succeeding number is taken as the sum of the two preceding numbers. As the sequence progresses, it is seen that the ratio of any two successive numbers approximates to f , and the further down the sequence the closer the ratio becomes to 1.6180339887… As the series is carried to infinity, the closer one comes to the absolute value of f , but f can never be reached in absolute terms. In this respect, both numbers f and p represent the search for absolute truth, or love, or God. We can strive to get closer and closer to these abstracts, but we can never finally reach them or define them absolutely. In absolute terms they are unknowable. The circle is the geometry that defines p , and the circle is traditionally taken as representing God. Before the universe was created there was nothing else but God. Beyond the boundary of the circle nothing existed, not even time and space. The circumference of the circle is that which encompasses all that is, and the area is all that is. All geometric forms that evolve out of prime numbers are contained within the circle, for it is the circle that defines their symmetry. Implicit within a circle, and its most fundamental product or creation is its diameter. There are an infinite number of possible diameters, but they are all identical to each other. So really there is only one diameter. The diameter is a straight line – it defines two points, its end points, both of which lie on the circumference located at extreme opposite positions. The line represents a single object, unity, and its end points symbolise duality or polar opposites. However, one in the sense of absolute exclusivity as distinct from one as a unit amongst many, is incomprehensible. Only God is absolute unity. Try to imagine that you alone existed within an infinite void – you would be incapable of identifying even yourself as there would be no datum point for recognition to occur. One therefore is meaningless, as only God is absolute unity, and one represents creation unmanifested. The diameter of a circle could be perceived as one, but in reality is two, which demonstrates the hidden nature of duality. Two enables the first step in the creation of consciousness to occur; it allows recognition to occur. A straight line, in this case the diameter, has two end points, identical but opposite. Two gives rise to creation because on can recognise the other. Because a straight line has two end points, flow or recognition of something else can occur. It can be seen now that duality, represented by the number 2, is the most fundamental principle of creation. Nothing can exist without its opposite. Thus the diameter of a circle symbolises the first and most fundamental manifestation within creation. p represents, therefore, the relationship that exists between God and His creations. All geometric forms arise out of this basic principle, the straight line containing two end points. The next step is five, bringing expanded consciousness into matter by virtue of f , the golden proportion. Five points equally spaced on the circumference of a circle give rise to the pentagon, within which lies the pentagram or 5-pointed star. This is generally accepted as representing man – the head, two legs astride, and two arms outstretched. The diagonal of a pentagon, in proportional relationship with its side, defines f . This is the purest form of proportion, and thus represents human consciousness in its greatest and most harmonious state. All creative expressions that emanate from man can be evaluated to the degree in which they incorporate the golden proportion. Consciousness, like f , cannot be defined in absolute terms. Perfect consciousness in matter is something to be sought. An evolved consciousness recognises perfect harmony, but in the imperfect state there is very little status attributed to harmony. Make what you will of the state the world is in at the beginning of the twenty-first century. It comes back to perception, and perception is linked to consciousness. Five and f are dominant in the structure of many living forms. The exotic flowers of love, the rose, the orchid, the azalea and the passion flower, are all governed by pentagonal symmetry, as are the flowers of all edible fruit-bearing plants. They demonstrate the gifts of the Creator within the realm of the purely physical. The United States central administration is housed in a building known as the Pentagon because of its shape. It signals American aspiration to bring harmony to the world. Whereas 5 expresses the potential for harmony hidden within the world of matter, 6 is explicit in its representation of symmetry and balance. The hexagon has all its diagonals passing through the centre of the circle and equal to the diameter. It has six axes of symmetry. Within it lies the hexagram (6-pointed star) and its 3-dimensional form the star tetrahedron. The hexagram is made up of two superimposed equilateral triangles, one inverted. The trinity has replicated itself in the world of matter as represented by the top inverted triangle. The lower triangle is a reflection of the upper one. The hexagram thus presents the challenge for mankind to recognise its own divinity. 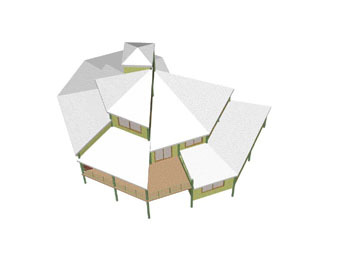 A building incorporating a thematic hexagon brings with it the vibration of spiritual healing. When architecture incorporates these symbols, they need only be implicit as a theme out of which the design evolves. The power within the symbols is vibrational, and the way they are used should optimally be compatible with the inhabitants. This is the role of the designer, to identify that compatibility. Numerology can be a useful tool here. When vibrational symbols are used as a rigid format springing from the mind, their power is limited. The mind is a tool. Only when thought is coupled with intent arising from the heart, does manifestation occur. This is the basic theory behind the influence that numbers have on our state of be-ing. These principles are able to be incorporated into the architecture of buildings with profound results, but as I have suggested, the effects they have are not the same for all people. In my essay, "The Nurturing House" I expand on this in more detail. I also deal with environmental factors that influence us vibrationally through the materials that are used in the structure of a building. Beautiful floral arrangements by Avas Flowers can bring harmony to any room in the house. 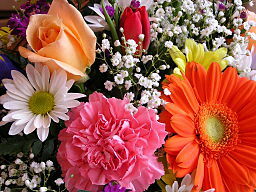 All pentagonal symmetrical flowers like roses, orchids, azaleas and passion flowers can be found at Avas Flowers online. 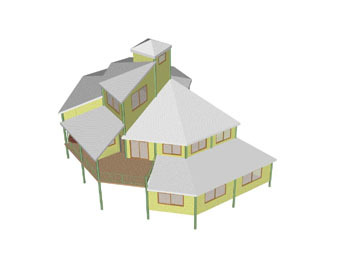 Click here to go to "The Nurturing House"
Click here to go to "John Koch Pole Frame Houses"